General Manager: The co-op is collectively managed. Alberta Cooperative seeks out and prioritizes products developed using organic and sustainable methods of agriculture whenever possible. Non-organics will be selected only if 1) the benefits of local outweigh the advantages of organic, 2) after research we find there is no organic option for a product that meets most or all of the other guidelines, 3) for political or environmental reasons organic is not available. The store prioritizes the purchasing of non GMO certified products and tries to maintain a GMO-free product selection and actively educate its members and customers about the issues of genetic manipulation in our food chain. 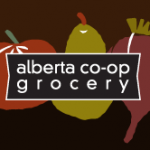 Alberta Co-op Grocery buyers follow the co-ops extensive Buying Guidelines, which state: "ACG will strive to maintain a GMO-free product selection and actively educate members and customers about the issues of genetic manipulation in our food chain." Whenever store staff become aware of genetically modified ingredients in products, buyers research alternative options and alert customers through proper signage, with buyers frequently discontinuing those items. The co-op does not currently provide labeling information beyond product labeling provided by brands.